Wait — shouldn’t political journalists be willing to discuss the media if they expect others to spill their guts on politics? Nope, not according to Weigel. @BuzzFeedBen I'm not kidding. Why keep volunteering for the dunk tank? Business Insider recently ran story on “Baked Alaska” — Tim Gionet — who said he used the word “spirit animal” in the BuzFeed newsroom and was scolded for it. Smith insisted on FNC that the incident never likely happened and that “Baked Alaska” went on to write something derogatory about Jews. On Thursday, Gionet returned the favor and leaked screenshots to Patrick Howley‘s Big League Politics, in the form of an internal BuzzFeed conversation calling for President Trump‘s assassination. 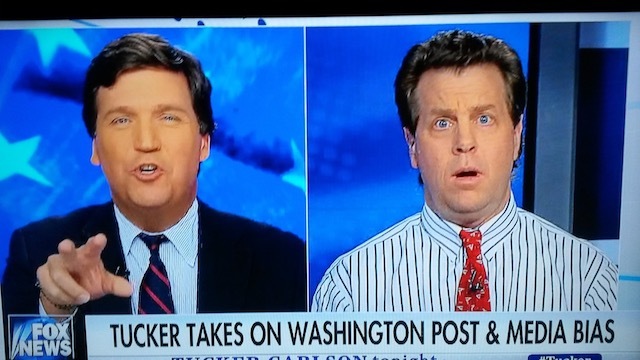 CARLSON: Hey, Ben, thanks for coming on. SMITH: Thanks for having me, Tucker. Congrats on the show, the book, the meme-ification. CARLSON: [Laughing] I don’t know what that means, but I will accept your congratulations. SMITH: I don’t know what the kingpin thing meant either, so we’re good. The tension between Carlson and Smith is longstanding. In 2010, just eight months after The Daily Caller was co-founded by Carlson, Smith said the pub was “struggling” and therefore attacking outlets like National Review. He has also called The Daily Caller “pathetic.” Carlson hasn’t been a huge fan of Smith. He has called Smith a “fanboy” of the Democrats. And there’s this: “It’s no surprise that a left wing hack like Ben Smith is, once again, being used as a mouthpiece by the DNC,” Carlson told FishbowlDC back in 2012. When asked to expound on his public warning, Weigel obliged. And what concert was that? “I think Japandroids,” he replied.